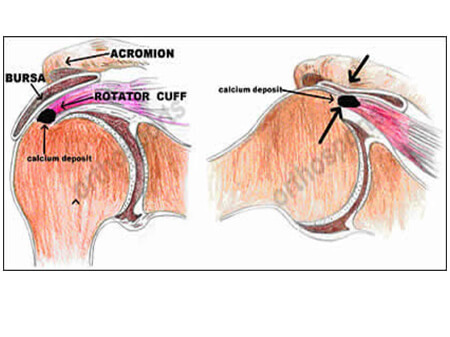 Calcific Tendinitis is the condition when calcium gets deposited in the rotator cuff. These calcium deposits in the tendons build up the pressure and also cause chemical irritation and lead to a lot of pain and it can get excruciating. Besides the chemical irritation and the pressure build up, these deposits lessen the space that is present between the acromion and the rotator cuff and affects the normal working of the cuff, which leads to a condition called subacromial impingement, when the arm is lifted overhead. As of now, the real cause of Calcific Tendinitis is not known. It is a condition seen mostly in adults in the age group 30-60. It usually stays for about 5-10 years and then goes off spontaneously. X-rays are used for the diagnosis of Calcified Tendinitis. For small sized calcium deposits, an ultrasound scan works better as X-rays might not always reveal them. Treatment is carried out with the use of anti-inflammatory medicines and physiotherapy. The shoulder is strengthened as much as possible with therapy. Steroid injections are also used to contain the inflammation. The deposits can be surgically excised as well. A method known as the Ultrasound Guided Barbotage is also used to remove the calcium deposits. This involves injecting the deposits with a solution of salt. Surgery is resolved to, only when the pain cannot be controlled by any other method, and the surgery is always aimed at countering the effects of the impingement. An increase in the amount of space between the acromion and the tendons of the rotator cuff facilitates movement that is less painful. If you would like to know more on the topic, please feel to drop us a message.